The thought of chocolate marshmallow candy brings back warm and sweet memories to my heart and mind. My mother and I both adored that delectable combination, especially when the chocolate and marshmallows were fresh. That's when they are PERFECT! Because my dear mom has gone on to heaven, I feel a bit nostalgic (if you know what I mean) whenever I'm contemplating a chocolate marshmallow treat. In fact, last Easter I saw some chocolate marshmallow eggs in the store and I just had to buy one to enjoy while sitting and thinking about my sweet mom and the blessing she was to my life. I think she would have liked that. One of our regular visitors and contributors (Connie Zakhary) sent me a photo this week of some gorgeous chocolate dipped marshmallows. 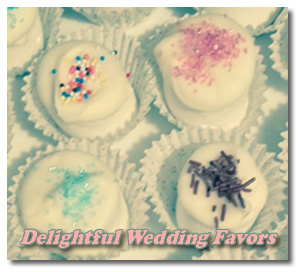 Connie made 300 of these mouthwatering morsels last month for her niece's wedding. Don't they look beautiful? I reckon her niece is a pretty lucky girl, don't you?! There are different ways to make your own chocolate marshmallow candy treats. You can start from scratch and make your own marshmallow, or you can take a quick shortcut using store-bought marshmallows and whip up something lickity-split. If you've got the ingredients in your pantry, you can literally create your own chocolate covered marshmallow party favors in about 10 minutes. That's all you need to make chocolate marshmallow candy in minutes! Simply melt the chocolate you've chosen. You can use a double boiler or the microwave. If you don't have a proper double boiler, you can place a bowl over the top of a smaller pot of simmering water. If you choose the microwave method, be sure to not overheat. Stir every 15 seconds to be on the safe side. Dip the marshmallows in the chocolate. Using a skewer poked in the end of the marshmallow may make it easier for you. You could even leave the skewers in each one to make it more like a pop if desired. Sprinkle on your chosen topping. You'll want to do this quickly before the chocolate sets. "I used vanilla flavoured Wilton's Candy Melts. I melted the chocolate in a pan over boiling water. 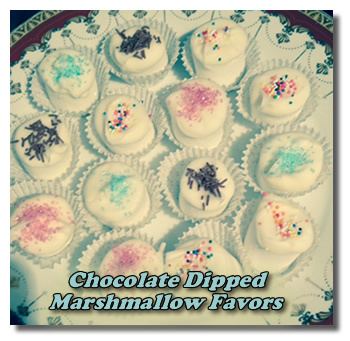 I then dipped one end of each marshmallow into the melted chocolate and added different colors of sprinkles." "I like to use colored sugar or chocolate sprinkles. Half a bag of the Candy Melts is enough to coat one bag of marshmallows." "After all marshmallows are dipped in the chocolate and sprinkled, I place them on wax or parchment paper on a tray, refrigerate and then place in decorative paper liners." "Another idea is to use colored Candy Melts and then decorate with coconut for contrast." As you can see from the photos, Connie placed each marshmallow in a paper cup liner. That's great for presentation all by itself, but she took it one step further since these were made as a wedding favor. Connie also wrapped each chocolate covered marshmallow individually in cellophane and added a pretty bow to create adorable little chocolate marshmallow wedding favors. So, once you get the simple basics down, you can get creative and make your chocolate marshmallow candy as fancy or pretty as you like. If you've never thought about making homemade marshmallows before, you may be surprised at how simple the process is. Give it a try and be amazed! 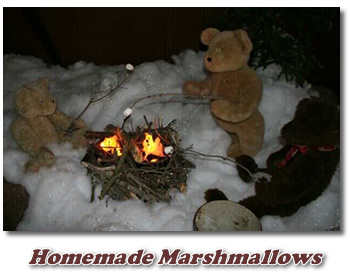 There are a couple of different recipes for homemade marshmallows, but they are all quite similar. This one is easy-peasy. Prepare a baking tray by spraying it with non-stick spray and then dusting it liberally with the powdered sugar/cornstarch mixture. (Save the remaining mixture to use at the end). In a heavy saucepan, combine the other 1/2 cup of water, the sugar, the corn syrup and the salt and place over medium heat with the lid on. Cook for 3-4 minutes to bring it to the boil. Remove the lid and attach a candy thermometer to the side and allow to cook (not stirring) until the temperature reaches 235-240 degrees F.
When the marshmallow has rested, sprinkle the powdered sugar/cornstarch mixture over the top and turn it onto a cutting board or marble slab. Dust the top again and cut your marshmallow into the desired size pieces. You can use a pizza cutter, scissors, or even cookie cutters if you want to get fancy. Once you've cut your marshmallows, be sure to dust all sides with the powdered sugar/cornstarch mixture. Store them in an airtight container at room temperature. They'll easily keep a week or two (if no one gobbles them up before then!). Okay, I know it sounds harder than it is, but give it a try. You're absolutely going to love making your own chocolate marshmallow candy using these homemade marshmallows. Add some flavored oil to the mixture in place of vanilla. Use colored sugar mixed in the powdered sugar coating. Use crushed candy canes or crushed nuts as a coating. Make colored marshmallows by adding a little food coloring when whisking. What other ideas can you come up with? Don't forget to share!